If you’re looking to bug out in an emergency, you’ll want the best premade bug out bag! This buying guide will help you find the best bug out bags in case you ever need to survive an emergency at home or away. Here you’ll find a wide variety of pre-packed bags that give you everything you need including rations, water filtration systems, first aid, and more! We’ve researched all the best bug out bags so you don’t have to. Let’s jump right in! Bug out bags give you and your family security when disaster and emergency strike. Filled with rations, first aid kits, and more, you’ll be able to keep your family going no matter if you’re stuck at home or outside in the wilderness. You might think all bug out bags come with the essentials, but how do you know what bag is the right one for you? Don’t worry, these bags won’t bug you as we’ve done all the research to give you the top ten bug out bags to choose from. People: When it comes to survival, you have to think about how many people you want to bring along with you. Every bag only provides enough resources for a certain number of people. Make sure whatever survival bag you choose has enough for everyone you want to bring with you! Hours: Surviving is all about time. How long do you think you’ll need rations for? Is this for weather emergencies or something bigger? More is always better than less, but think about the emergencies you could run into without all the bug out bag essentials before purchasing. Bag Type: Whether you’re looking for a bug out backpack or duffel bag, the bag type is important when you’re rushing out the door. Be sure to check out what types of bags are available so you can easily store and run out the door with it when the time comes to use it. Weight: If your bag is too heavy, who will bring it along? Some bags are big enough to weigh you down if you’re running from trouble. Others are light as a feather, but don’t have any extra luxuries. Double check the weight of each bug out bag kit to ensure you can pick it up with ease when trouble strikes. Size: Depending on the size of the bug out bag, you might find it difficult to store your bag where you can get to it easily. Size is also important if you’re looking for a car bug out bag or taking your bag outdoors. Check the dimensions of every bag to find the perfect size for your house, car, or tent. Water: Water is a must-have in case of emergencies. Whether you’re stuck inside during a storm with no way to get resources or on the trail lost and dehydrated, water may not be around when you need it. If you’re looking for water, be sure to double check the components list for every pack. Now that you know how to pick the perfect bug out bag for you, it’s time to get to the reviews. If you’re in a rush, no worries, just check out the top pick and budget picks to find the two very best premade bug out bags without the hassle. With the SSC Family Survival Bag can have the ultimate pack for you and three other survivors. The bug out bag contents include a water filtration system, 3 different light sources in case of outages, food for 72 hours, blankets, utensils, and a portable stove. This pack is considered premium as it includes bath wipes for all and a portable stove. The Sawyer Squeeze water filtration is another component that makes this bug out bag practical for indoor and outdoor use during a disaster. The SSC Family Survival Bag is also unique as it provides you with bowls and utensils to eat your food with, unlike most other bags! This kit is our Top Pick because it provides all the essentials for a handful of survivors. With access to first aid, basic nutrition, light sources, and water, you will be hard pressed to find all of these components in another bag. 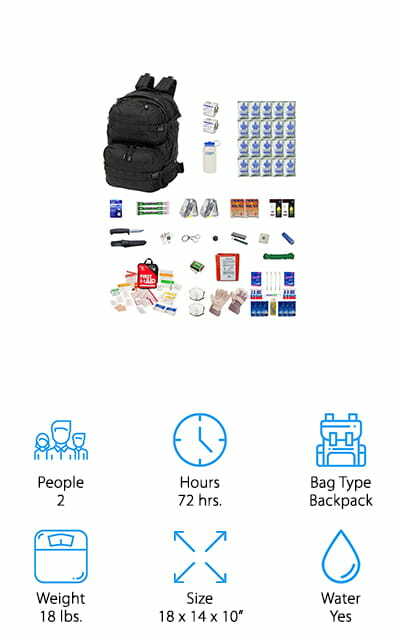 The bottom line is, this bag is packed to the brim with everything you need to keep you and your family safe during an emergency. The Urban kit gives you all the basics you need to survive a few nights when disaster strikes. The bug out bag contents include water, sleeping bags, first aid, weather protection, water purification, food and a variety of tools. 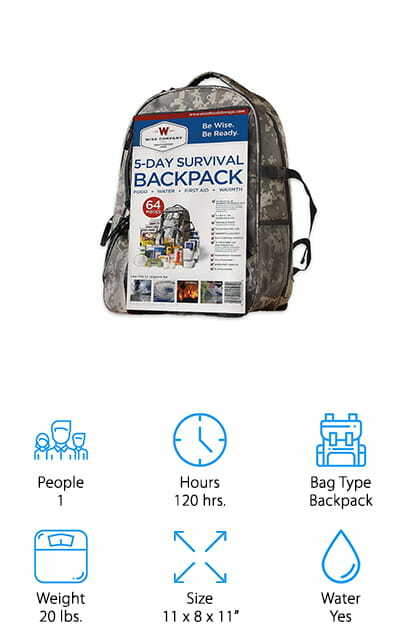 Depending on what size bag you choose, you will have all you need for two to four person groups of survivors. The backpack itself is black to help blend into surroundings whether you’re indoors or out. This pack also includes weather protection in the forms of a tent and ponchos to keep you dry. Hand warmers are also included to help you stay warm. What makes this bag unique is that it includes extra tools that other bug out bags don’t. Things like sleeping bags, rope, duct tape, toilet paper, and feminine products are included in both the two and four person packs. The Urban bug out bag kit is the perfect budget pack for anyone on the hunt for an emergency supply! The Complete Earthquake Bag is a lightweight, two-person kit that is perfect for 72 hours of disaster survival. The food and water in this pack have a 5-year shelf life, so there’s no need to worry about replacing these items soon if you don’t use them. 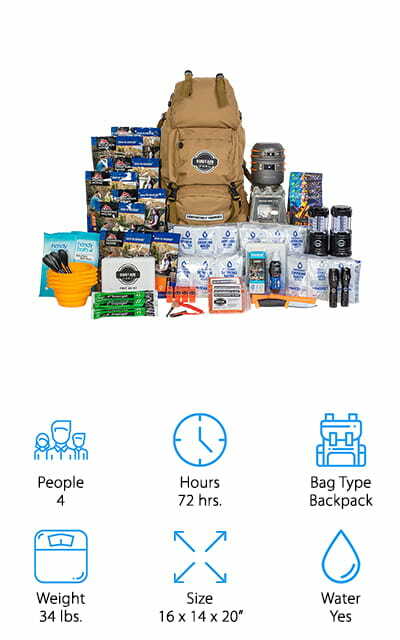 This backpack’s contents include a few bonus items like a tent, hand warmers, dust masks, and an earthquake bag patch. 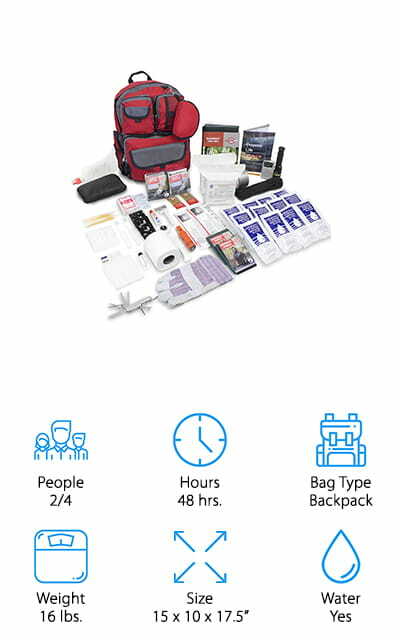 Although this bug out bag was designed for earthquakes specifically, many of the items will work for almost any other natural disaster. The best part is that the bag itself is a bright red color to make locating the bag is easy when disaster occurs, day or night. All light sources included in this pack are hand-cranked, so no batteries are required to use them. 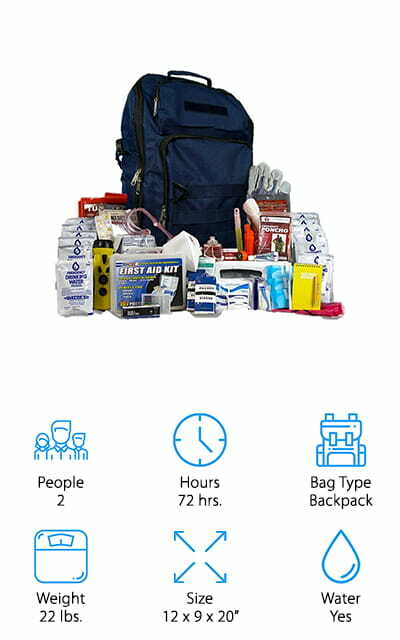 The Complete Earthquake bag is a great fit for anyone looking to stay safe during a natural disaster as it has all the essentials and then some to provide shelter, safety, and nutrition. The Family Prep Kit is brought to you by the same company that created the Urban Kit. This kit provides enough resources for a 2-4 person family to find their way safely out of an emergency. Much like the Urban bug out bag, this bag has enough food and water for 48 hours. But if you run out of water, there are also water purification packets to turn any nearby water source into drinkable water. If you’re unsure of what to do in your emergency, there is a handout inside the backpack that will explain what your next steps should be if disaster comes. This bag also includes things like washcloths, toothbrushes, shampoo, and a razor. If you’re looking for a bag that includes some of the luxuries of regular life, this bag is for you and your family. It gets better! This pack also includes entertainment in the form of playing cards to keep everyone busy while awaiting rescue. The Family Prep Kit provides an entire family with a way to survive with extra benefits that give them little luxuries while waiting out the storm. 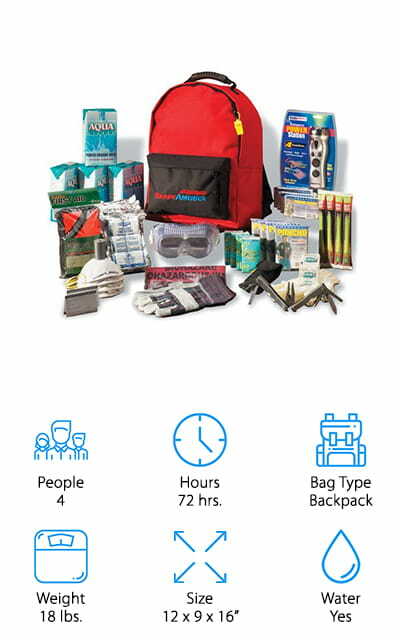 The Wise Company Bug Out Backpack is just for you during any natural disaster. This kit comes with five days-worth of food and water. A portable stove and fuel tablets are perfect for whipping up your meals in a hurry. This kit also includes a dust mask, first aid kit, waterproof matches, and a 11-in-1 survival tool. Your survival tool includes a knife, screwdriver, saw, can opener, wrench, and more because you never know what you’ll need or when. This backpack’s tools will come in handy for any disaster: a shovel, axe, fire starter, and signal mirror. You will also have a serrated knife and survival whistle to get yourself out of a bind if needed. Unlike bigger packs for multiple people, you’ll find bigger and heavier duty tools in this pack as there is more room to store these items without all the added food and water. Because this is a one-person kit, the Wise Company Bug Out Backpack provides more tools for your survival! Stocked with U.S. Coast Guard approved food and water, the Ready America Emergency Kit is the perfect survival bag for four people. 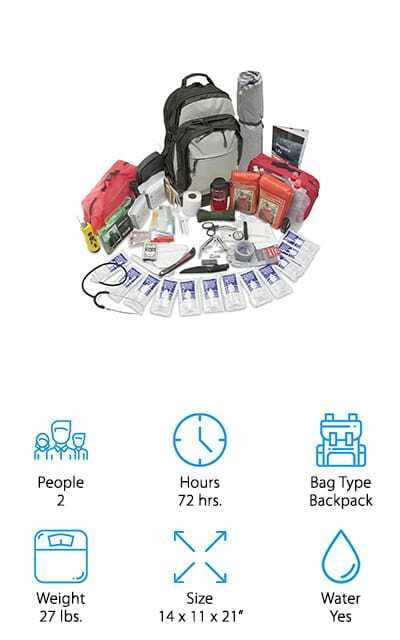 This kit includes water, rations, first aid, tools, and many other items that other bags offer, but there is one different item that sets this kit apart. This bug out bag includes a special hand-crank emergency station that allows for 30 minutes of bright light, 2 minutes of cell phone time, and 15 minutes of radio time all from one minute of cranking. This kit also includes a multi-functional tool that will come in handy during the disaster. Survival blankets, ponchos, gloves, and safety goggles will keep you from being exposed to the scene around you. The small hygiene kit includes tissues, pre-moistened towelettes, and biohazard bags in case of sickness. With the emergency station included, this backpack sets itself apart from others as it provides an endless power source as long as hands are available to crank it. Weighing in at eighteen pounds, this two-person survival kit provides enough lifesaving resources for three days. 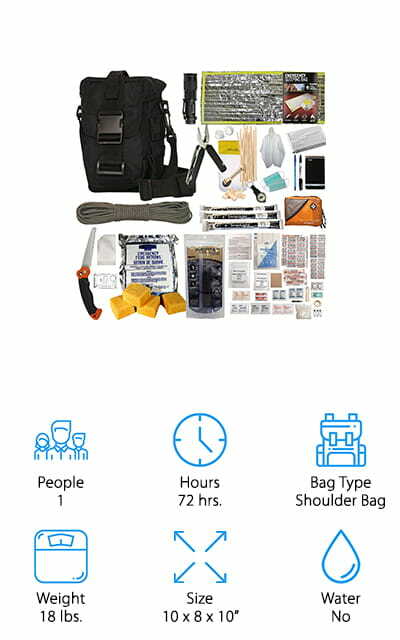 This tactical backpack includes a compass, survival knife, water bottle, first aid kit, and sanitary kit all in one place. The Zippmo kit also includes enough water purification tablets to purify 6 plus gallons of water if water supplies run low. This pack also includes a Nalgene water bottle to store your filtered water in instead of a water bag or pouch like other packs. Snaplights will give you light in the darkness, as well as a mini LED flashlight when the snaplights run out. The saw and knife tools inside this pack allow you to saw, cut, and slice through anything you that gets in your way. If you lose your way, the button compass will get you back on track to where you need to be. Although this kit doesn’t have extra luxuries like shampoo or playing cards, it is perfect for those who want to stay dry, warm, and safe during an emergency. This tactical bug out backpack comes with food, water, and other survival gear. All food and water are U.S. Coast Guard approved, making it a trusted ally when emergency strikes. You’ll find all the essentials for water purification inside, too! The first aid kit is comprised of 107 pieces to ensure you are covered head to toe in case of injury or sickness. A hand crank flashlight, radio, and phone charger is included in this pack to provide enough power to wait out the storm. Waterproof matches and a 30 hour candle will help you stay warm and see what your next move is in the dark. If you get in a real bind or find yourself in an area that is not safe to touch, your dust mask, gloves, and safety goggles will keep your body from harm. Along with the essentials, this pack has a hygiene kit, first aid kit, knife, sleeping bags, and a handful of other tools to help you survive during your emergency. We’re back with another pack from Emergency Zone, but one that’s made just for stealth. When disaster strikes, many will panic and go from their best self to their worst. This bug out bag was made for you if you’re looking for sleek and stealthy ways to survive. Like other Emergency Zone packs, you’ll find the basic food and water rations for 72 hours. A radio and compact flashlight are provided to help you reach others for rescue or just to see yourself through the night. If bad weather comes, there are rain ponchos, sleeping bags, and a tent to keep you dry. But more importantly, your bag of food, water, and tools will stay dry with a waterproof backpack cover that is included. The hygiene and first aid kits, although smaller than others, come with the essentials needed to stay clean and healthy during your emergency. If you’re looking to move in stealth through your disaster area, this pack is the perfect one for you! 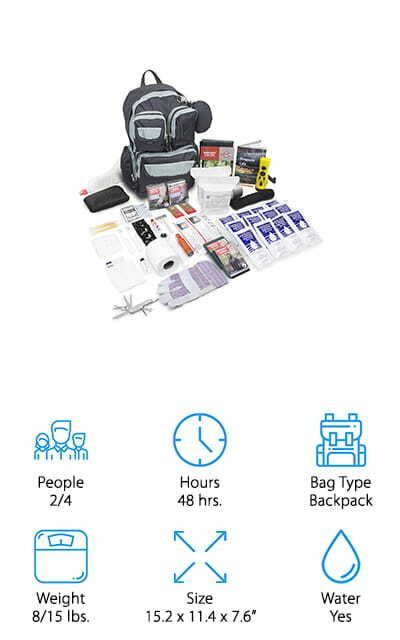 Inside the Prepper’s Favorite Get Home Bag, you’ll find everything you need to survive for 72 hours alone. With a 5-year shelf life, you’ll find 3600 calorie survival bars and nine pre-measured meals inside your pack. Although there is no water in this pack, this bug out bag comes with a water filtration straw and two sizes of hydration bags to store your filtered water. Using a coconut shell carbon filter, the filtration straw allows you to drink from any other water source instantly, filtering out all the bad minerals as you drink. Not only does it remove the bad minerals, the straw also keeps out parasites and protects you against 99.9% of Cryptosporidium and Gardia. Keeping your water safe means keeping you healthy! Made with tactical materials, this bag is durable enough for indoor and outdoor emergency use. This bug out bag backpack was made for your 3-day trip home or away to get you to safe shelter and resources no matter where you are.